IBM has published a list of Hello World Tutorials on multiple technologies. The tutorials span across the DB2, Lotus, Rational and WebSphere. Here is the list of the tutorials published. Don Jones has discussed the WebSphere Portal Security concepts here. A nice presentation from the Morgan Stanley team on the Technology / Internet Trends. The presentation was given at Web 2.0 Summit in SFO. This session describes the architecture and implementation of an embeddable, extensible enterprise content management core for Java EE and simpler platforms. The presentation starts by describing the general architectural concepts used as building blocks. The described implementation, Nuxeo Core, can be embedded in a basic Java technology-based framework based on OSGi (such as Eclipse) or in one based on Java EE, according to the needs of the application using it. This means that the core has to function without relying on Java EE services but also has to take advantage of them when they are available (providing clustering, messaging, caching, remoting, and advanced deployment). 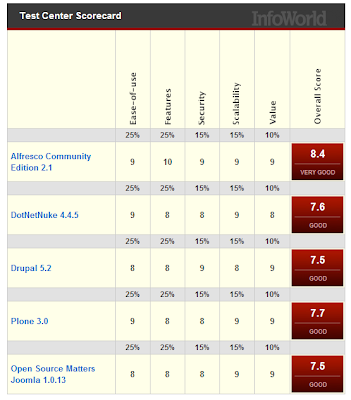 InfoWorld has launched the Best of Open Source Software awards across the IT landscape -- in applications, operating platforms, middleware, software development, networking, security, and storage. Here is the list of the Top offerings in CRM, ERP, portals, content management, and collaboration platforms. Tim O Reilly's keynote at SAP TechEd. When it comes to deciding between the various open source CMS’ solutions (Alfresco, DotNetNuke, Drupal, Joomla or Plone), the first thing that attracted you – is the FREE tag associated with these open source products. Question is what is FREE and what is NOT FREE exactly? So, even though the software’s are free, there are other hidden costs that need to be accounted for before taking the decision. Read Mike Heck's complete article here. Given the page hierarchy A -> B -> C, when you move C under A and remove B, what actually happens is that first B and all its children are deleted (or marked as deleted) and then C is tried to be created with only the subset of information that is detected by Releasebuilder. This then results in a new, incomplete page. first move the page and transport that move from staging to production, then do the delete and move that forward. A fix is available here. This will make sure that the release builder will export the whole page information, if the content or derivation parent is changed. Standards : How much we need them ? Standards are meant for products features that are no longer niche. Once they become commodity, standards are just small note that the products are compliant for so and so standard. Further, if everything was standard, lot of us will be rendered useless. Remember Y2K was a migration exercise for the very reason that there were no standards and everybody made money. WAS CE (Community Edition) is build upon Apache Geronimo. Now, IBM has released a red book on how to migrate the applications developed fro WAS CE ed to WAS V6.1 ed. It seems all along that was the plan - get you hooked on the free stuff and once hooked, you need to move up the ladder (WAS V6.1 in this case)and start the pay back time. Overall, the migration steps are pretty straightforward. I like the chapter 3 and 5. Chapter deals with Migration Strategy. The same guidelines are applicable for any migrations. Chapter 5 deals about Common Migration Issues - which is kind of best practices when doing such things. Check out the red book here. You can check out some of the Yahoo Pipes here PCM News. What I did , googled for PCM related keywords, take their feed, mash them together, give a rating as per my need and generated a new feed. There is another nice article on Yahoo Pipes and Google Mashups here. Sounds unbelievable ! Read On. The organization has been a .NET shop but now wants to implement the WebSphere Portal. Options - dump the entire .NET Team and hire a fresh set of WP programmers. Or use the Mainsoft's Java EE for Portal Edition. It provides .NET extensions to WebSphere Portal, allowing you to create and deliver a complete front-end Service Oriented Architecture , with equal access to .NET and Java services. Using a single sign-on, end users gain a personalized, role-based access to .NET and Java applications with consistent branding and navigation. In addition, business analysts can easily compose enterprise applications using .NET and Java components using WebSphere Portal's Application Templates and JSR 168 compliant Inter-Portlet Communications. Read about one of the early adopters here. WebSphere Portal offers users the option to personalize layout and contents of pages. On the other hand, as an administrator you might want to preserve the layout or contents of pages, or parts of pages, which for example reflect your corporate identitiy. This Tech Note describes how you can prevent the personalization of such portal pages by users. RSS, or Really Simple Syndication, is a technical format that allows online publishers to share and distribute their content to other websites or individual Internet users. When a new article is posted or a change made to a webpage, RSS keeps track of the changes and delivers them to the subscriber. RSS feeds are most often attached to text, images, podcasts and video. To create RSS feeds for your site, you have variety of options. Lets explore them. then next are the corporates that might want to build there own feed generation service embedded in their application. For such discerning folks, we have the ROME open source library. Check out the same here. Here is the sample code where the feed is generated via a java program for your content. Unit testing asynchronous applications like Ajax based applications has really been a pain area. With Ajax coming in, some of the Automated testing have been found lacking i n the same. The Google Web Toolkit noticed this and has come out with an approach to write JUnits for the your Ajax applications. To see and understand, how you can write JUnits for Ajax applications, check out the following article here. The documentation around the GWTTestCase class can be found here. Another article talks about running JUnits for GWT in eclipse. Check out the same here. User goes to a page and changes the state of a portlet A. The user then navigates to a different page and when you return to the initial page with portlet A, the state of that portlet is the same state as when you left the page (the changed state). One expect the portlet to return to its initial state when you return to the page. Software company Once Technologies has released what it claims is the first browser-based Web 2.0 development platform as an open source project. once:radix is a Rapid Application Development system for Intranet and eXtranet environments. It allows developers with only basic programming skills to create sophisticated enterprise-level applications. The decision to release the software under an open source license will allow SMEs to access Web 2.0 technology; till now only available to large firms that could afford to employ specialist programmers and database designers. once:radix delivers world-class performance through a combination of its own software and some of the world's best open-source solutions, including PostgreSQL, JasperReports, Mozilla and Apache projects. The first distro is planned to be released on 7th August. BEA AquaLogic® Pathways – Helps to combines search, content tagging, bookmarking and activity analytics to deliver a better way to discover information and people. IBM announced four separate technology offerings: Lotus Connections, Lotus Quickr, Info 2.0 and WebSphere Commerce. Lotus Connections is a suite of five purely Web 2.0 components designed to help companies find experts on topics, bring together teams around a common point and access information. The components enable users to create social bookmarks and tagging and build Web dashboards, blogs, and online communities and profiles, such as what's offered on Facebook or LinkedIn. Lotus Quickr is an open standards-based collaboration tool that enables teams inside and outside a company to work together across different geographies, operating systems and working styles, IBM officials said. Its collaboration capabilities include blogs, wikis—software that enables anyone to input qualified information on a Web page or site—and team space templates that support the processes necessary to get collaboration project up quickly. Info 2.0 is a set of tools designed to unlock data and enable business users to create mashups—the remix and repurposing of data into a single application or Web site, such as a mix of Google Maps with a real estate site to show where available homes are located. Oracle WebCenter combines the standards-based, declarative development of JavaServer Faces, the flexibility and power of portlets and runtime customization, and a set of integrated Web 2.0 services into a new generation of context-centric, composite applications. WebCenter Services include a complete set of Web 2.0 content, search, collaboration, and communication services that can be embedded directly into applications built with the WebCenter Framework. Go2Web20.net is an interactive listing of so-called Web 2.0 apps available online. The list is presented as an enormous assortment of mini logos. Moving your mouse over the tiles gives you the name of the service and a one sentence synopsis. Click on it and a more complete information tab rises from the bottom of the page. You can search by name or browse tags, sort by date. This article shows you step by step procedure for creating your own Google Gadget. The sample gadget fetches and displays the DevX feeds. An Atom service document is for more than just telling readers where to find a site's feeds. This article show you how to parse the atom service document to discover the site's workspaces, feeds and categories. I was looking at Google Trends and keyed in the "web 2.0" to see from which region/country is generating the maximum interest. Results are not too surprising. The interest seems to have starting going up since beginning of 2005 and is on a upward curve since then. Region wise, the South east countries seem to be showing lot of interest. Check out some great articles on the same here. I had talked of What is Web 2.0 some days back. Since then, I have been doing lot of reading and had discussions with my colleagues also on the same. Finally, I think I understand the need for Web 2.0 and all the collaboration techniques Web 2.0 brings together. I believe is the Web 2.0 is nothing but a manifestation of the human behavior. Web 1.0 was more of a one way traffic. The content is published but you have no clue who is reading it and in what way the data is being used. It is like humans watching television, you can see and hear everything but have no means to participate. But we human beings have opinions, likes and dislikes, want to share things with each other, we are interested in knowing what are neighbors are doing, who is going out with whom and so on ??. In the real environment, we have our informal channels, gossip aunties and what not? Remember, lot of people read tabloids to see what celebrities are doing or not doing ? Now, if we need to create a similar eco-system in the wired world, the Web 2.0 technologies ( Social Networking, Mashups, Folksonomy, Wikis etc) start making sense. The irony is, Web 2.0 helps in creating the environment, which we are missing by being sitting in front on the computer. IBM Portlet for Google Gadgets is a JSR 168 portlet that allows enterprise portal users to integrate Google Gadgets for web pages with their portal pages. Google Gadgets for web pages are remotely accessible services that provide access to online content and applications designed to be aggregated into the context of a web page. These include language translators, maps, YouTube videos, and Wikipedia. Check out here for more details on downloading the same. Anthony (Joey) Bernal talks out the guidelines to be followed when recommending Out of Box Portlets for a WebSphere Portal based solution, for your customers. The term Web 2.0 has really been foxing me. I have seen the term being used at variety of places and for variety of reasons. Terms like Ajax, Folksonomy, Wikis, Blogs, Mashup , Syndication has been there for some time, but their association with Web 2.0 was not something I was able to apprehend. In the end, applications that make use of the collective intelligence of its users/audience and able to enrich the experience of the users are truly successful. The Web 2.0 framework comprises of such technologies ( Ajax, Folksonomy, Wikis, Blogs, Mashup , Syndication etc) that allow companies to create such applications. 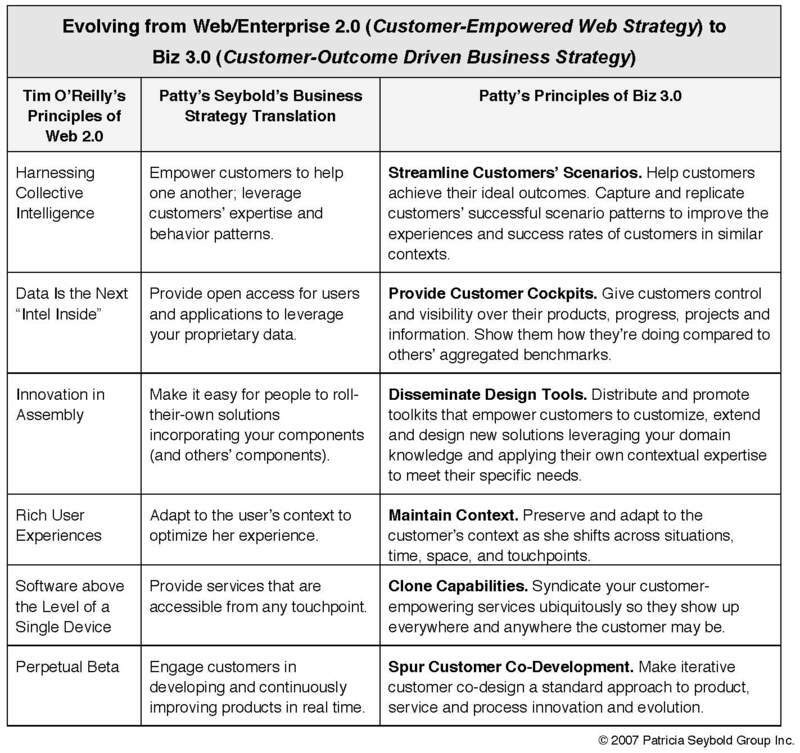 In the end, Web 2.0 needs to be used for creating Real enterprise value. Patty Seybold tells here, how to use the Web 2.0 principles and harness the same into a business strategy. If you're building an application that requires a custom isolation level in a global transaction during the execution of a use case, you've probably found out the hard way that the Java™ Transaction API doesn't support custom isolation levels. Fortunately, the Spring framework lets you design Web and enterprise applications that use custom isolation levels in global transactions. In this article, Ricardo Olivieri walks through two alternative approaches to achieving this goal. The esapi.jar and siapi.jar files found under the OmniFind /lib directory are required. This technical note provides detailed information about how the WebSphere Portal login or logout flow can be extended or customized by using the login and logout commands. Focused on versions 5.1.0.x and 6.0 of Portal, the technote describes the configuration and the interfaces of the commands, followed by two code samples that are also available for download. Why Portals might be crawling?? Login process - Might be taking too long. Caching – to get that extra performance, lot of times, we try to get the whole data and cache, so that when the user clicks more or expand, we might be able to serve from the cache. Does my project needs an Architect ? In these days of framework and a standard 'n' layer framework, projects are making use of Struts/JSF in the presentation tier, IoC(Spring) for the middle tier and using Hibernate/iBatis/Toplink for the data mapping. The methodology and the pattern of using these frameworks is pretty much standard. The development standards for design, coding, testing are again pre-defined. Given all this, my question is what value does an Architect brings to the project. Again, the above tasks are more or less pre-defined. External Systems pre-define how they need to be invoked. Not much rocket science left there. If the Build process are good, lot of statistics for code quality and other code metrics (using tools like Checkstyle, PMD, Java NCSS, JDepend) can be generated on a daily basis. Application tuning means running Load Tests, Checks for Memory leaks, Object usage etc - again each of these can be determined using tools available in the market. Based on all this, where do you see the need for an Architect in a project? The coming of Aspects in the programming world has brought so much of clean. I, no longer need to write tons of code for logging, transaction handling, security and what not. I think of a service and next I know what aspect I need to implement. To get started, please check out the following presentation here. In Order to monitor failed login attempts to WebSphere® Portal version 5.1, for example, for a business requirement for auditing purposes. Refer to the following Tech Note. Every body gets confused at times, on how many design patterns are there, what are those design patterns, which are the GOF patterns, what are J2EE patterns and what not. Are there any testing patterns, are there GUI patterns and so on. Martin Fowler has written a very good article on the guidelines to be followed when conducting the Stand Up meetings. Check out the same here. If you are coming late to the meeting, make sure to inform. The fine money collected for the week was used for having lunch/snacks during the week depending on the amount collected. Mock objects are dummy objects that mimic the behavior of real objects. The use of mock objects for unit testing has really picked up in recent times. Here I list some of the good articles available to helo you get started. How to export credential secrets using XMLAccess? or import of encrypted credential secrets during migration. key of the specified length for the encryption. IBM has released a tool that detects delays and hangs in WebSphere(R) trace and HTTP plug-in trace. WebSphere® Application Server trace is used to obtain detailed information about running components, including application servers, clients, and other processes in the environment, such as the time and sequence of methods called by base classes. IBM® Trace and Request Analyzer for WebSphere Application Server allows you to find delays and possible hangs from WebSphere trace files and HTTP plug-in traces by parsing call trees of methods and traces and calculating delays in each method and trace. The package includes a Java™ graphical user interface (GUI) application that displays delays in lists and tables. IBM® Unstructured Information Modeler is designed for use by data analysts on unstructured data sets. An example of such a data set would be problem ticket logs from a computer help desk. The data analysts' task is to find out what the commonly occurring problems are and to write or find solutions that will solve these problems in an automated way. IBM Unstructured Information Modeler helps the data analyst perform this task by automatically classifying the unstructured data set and providing insight into the categories. The tool further allows the user to modify the automatically-created categorization to incorporate any domain knowledge that the user may have in order to make the categorization more sensible. After the classification has been completed, the user can generate reports and create a classification engine for categorizing new problem tickets. In addition, IBM Unstructured Information Modeler can analyze trends by day, week, or month and can analyze correlations against a user-supplied categorical feature. The timeout.resume.session parameter is not included in the /shared/app/config/services/ConfigService.properties by default, which equates to the parameter being set to "false." Therefore, if an idle session timeout is experienced, a user will see the ErrorSessionTimeout screen and be forced to re-login. The login causes a new session to be created. This session is separate from the LTPA security token which allows for Single Sign-On. The timeout.resume.session parameter should be set to "true" in cases where you do not wish for users to see the ErrorSessionTimeout screen and have to re-login to WebSphere Portal once the inactivity timeout for the WebSphere Portal application is exceeded. An example scenario would be if you were using an External Security Manager (ESM) and Trust Association Interceptor (TAI) to handle authentication for WebSphere Portal. You could take advantage of the security invalidation and timeout features of the ESM and TAI to control when the session gets invalidated (and thus when the user gets redirected to ESM's login page to re-login). Session Inactivity timeout set to 5 minutes in WebSphere Administration console for WebSphere Portal application.